Yesterday, Qualcomm made its official release of their next generation fast charging technology: Quick Charge 3.0. Actually, we just use the same Tronsmart reference design as our popular WC1Q model but changed the internal PCBA to include the faster ports and charging components. The new quick charge 3.0 model is called the WC1T. So for the consumers interested in this technology, the question is, what is Quick Charge 3.0 and how does this affect me? First, The WC1T Quick charge 3.0 chargers still use the 18W solution for smartphone and tablet, it is the same as Quick Charge 2.0, but how is it able to charge faster than QC2.0? On Qualcomm’s official site, they claim the Quick charge 3.0 standard is 38 percent more efficient than the previous Quick charge 2.0. This is the most important feature of QC3.0, as the higher efficiency means that using the same total wattage, you get faster-charging results in the same time period. This also means you get less heat when charging, which results in a far safer method for manipulating and increasing the lifespan of your smartphone battery. The reason explained by Qualcomm is something they refer to as INOV Technology (Intelligent Negotiation for Optimum Voltage) in Quick Charge 3.0 standard. In the previous QC2.0 standard, The charger output should be 5V/2A, 9V/2A, 12V/1.67A, while QC3.0 offers a more granular range of voltages: 200mV increments, from 3.6V to 20V. This very fine and controlled step-up philosophy of incremental bumps in voltage is far superior to the older generation QC2.0 standard. When you charge your phone from 0%, at first, the charger will give the full 18W (9v/2a) of total output to the device’s battery. After charging for a while, for example, the phone battery then may only need 16w of total power or lower, but the charger still charges the full 18W. In this example, the spare wattage will be wasted and unnecessary, which in turn changes to heat and strain on your battery. However, in the new QC3.0 standard, the voltage can change via 0.2v bumps until it finds the ideal total wattage output. For example, at first, it gives your phone battery 9V/2A total 18w, as explained more above. After charging for a while, the battery then may only need 16W, and the charger will also automatically adjust output and give the required 16w power. There will now be very little wattage wasted and considerably less heat created which will extend the life and performance of your battery. So the next question is, Will I need special charging cables for the new QC3.0 chargers? The answer is, Yes. From the above analysis, we can see in QC2.0, the max charging current is just 2A, however in QC3.0, the charging current can reach 3A or more in some cases. Your charging cables should absolutely be able to handle this HIGHER current and take advantage of the additional power capacity and performance of the charger. We will update our Micro USB cables soon to meet the new QC3.0 standard. In addition to updating them, we will provide one FREE Quick Charge 3.0 micro USB cable in the package for your device, as Tronsmart has done in the past for our customers. Last question, Should we expect to see more Quick Charge 3.0 Chargers on the market soon? Yes, after we have verified our WC1T Quick Charge 3.0 charger for full production, we will bring our multi-port Quick Charge 3.0 wall charger and car chargers to market in time for Christmas. Just follow us on Social Media to get the latest news and updates regarding product releases and where to buy them first. We will continue to be the market leader in this segment and you will continue to be the first to know and have access to our product lines. Currently, we have some WC1T samples fully designed, approved, and ready for testing. （Please note, because Qualcomm just releases the Quick Charge 3.0 2 days ago, The certified standard has not been confirmed, We are keep following this certified, and once they open certified, we will sending our device for testing, and certified. ) You have the opportunity to be among the first in the world to review these Quick Charge 3.0 Wall chargers coming onto the market by Tronsmart! 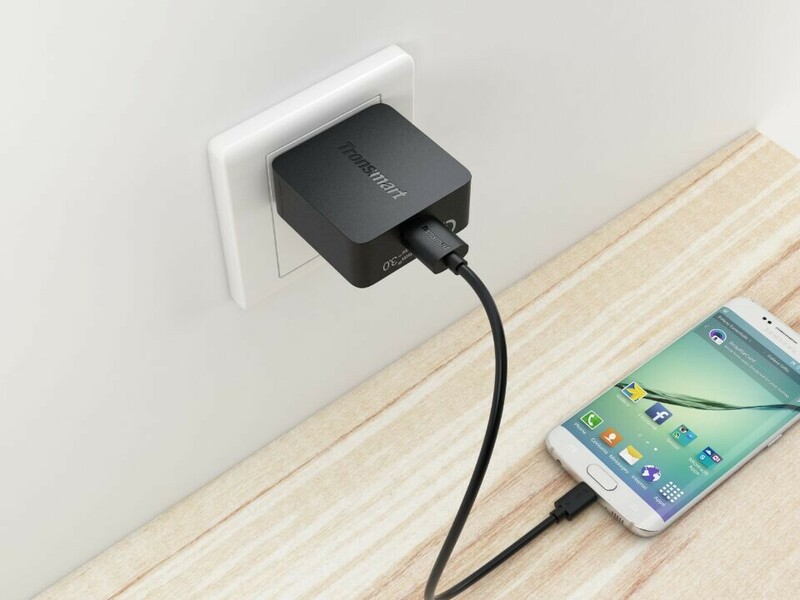 Just leave a comment below telling us why you want to have access to this QC3.0 wall charger first. Please tell us if you currently own any device supporting quick charge technology (1.0 or 2.0)? and what is your thoughts about quick charge and how it can improve your time management and device usage? We will choose a lucky winner or winners among the comments posted below and send the free charger along to you at no additional cost. Our gift for your interest in Tronsmart and our continued commitment to cutting edge charging solutions for the world’s best customers. Enjoy the fast charging technology, Less time charging. More time doing!